Ah, at least I have a picture in this one. Will have to see about the other one. I finally was able to get these blocks sewn together as I have had the larger print since I was in the hospital. A friend in Kansas City was able to get it from her local shop, since it is a Kansas Troubles print. 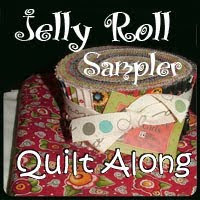 That's what the Jelly Roll was and all the other prints I have used. 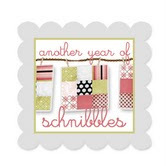 Now I have an idea of another border but that will be in the next blog. Since the pictures I sent all went into seperate blogs. I have been having Physical Therapy three times a week and each day goes a little further. On wed. I asked about using a cane and she had me walk around some walkways twice and decided I was doing well enough. So stopped at the store and got a cane. So am coming along. Have two more weeks yet of PT. Next Friday I see the Doctor again and am hoping he will say I can drive. I don't like having to depend on someone else all the time. Thanks for dropping by. Sounds like you are making good progress Eileen, although I imagine that it has been a lot of very difficult work. I hope that you get your wish and are able to drive soon. It's amazing how much more free we feel when we know that the car is there and we can go if we want to, even if we don't intend to go anywhere. The quilt is lovely.